Kutna Hora, a small city east of Prague, contains an entire historical quarter that is a UNESCO World Heritage Site, more correctly called “Kutná Hora: Historical Town Centre with the Church of St Barbara and the Cathedral of Our Lady at Sedlec.” The old town maintains its original medieval layout, established at a time when the town prospered based on income from silver mining. Most houses in the old center still keep their medieval look on the inside, but with facades that reflect prosperity in Gothic and/or Baroque form. Kutna Hora UNESCO site isn’t just about a pretty old town, though. 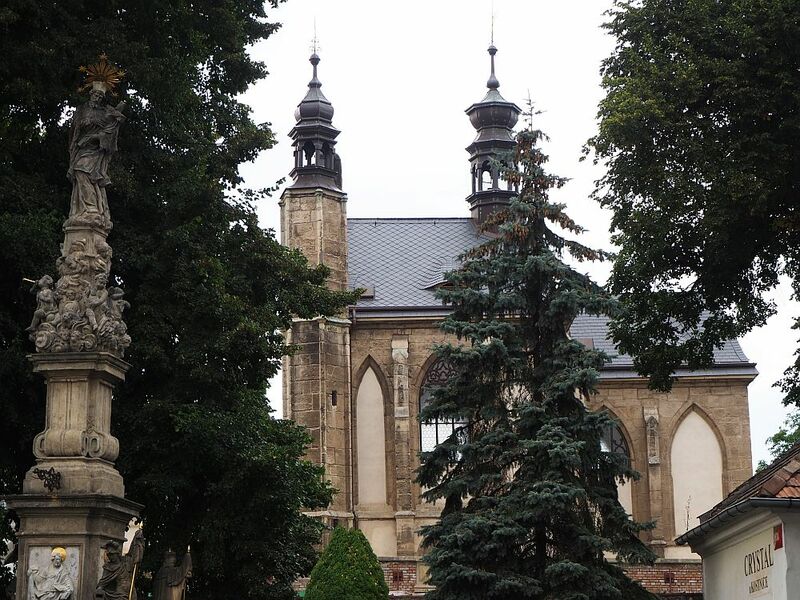 The UNESCO designation, as its UNESCO title indicates, particularly focuses on two churches: St. Barbara’s and Our Lady at Sedlec. St. Barbara’s is an ornate late-Gothic cathedral, started in the 14th century but not actually finished for another 500 years. Its size and expense testify to the profitability of the silver-mining industry. It is included in the UNESCO designation because of its influence on the architecture of central Europe. This side view of St. Barbara’s Cathedral clearly shows the late Gothic influences on the architecture, flying buttresses and all. 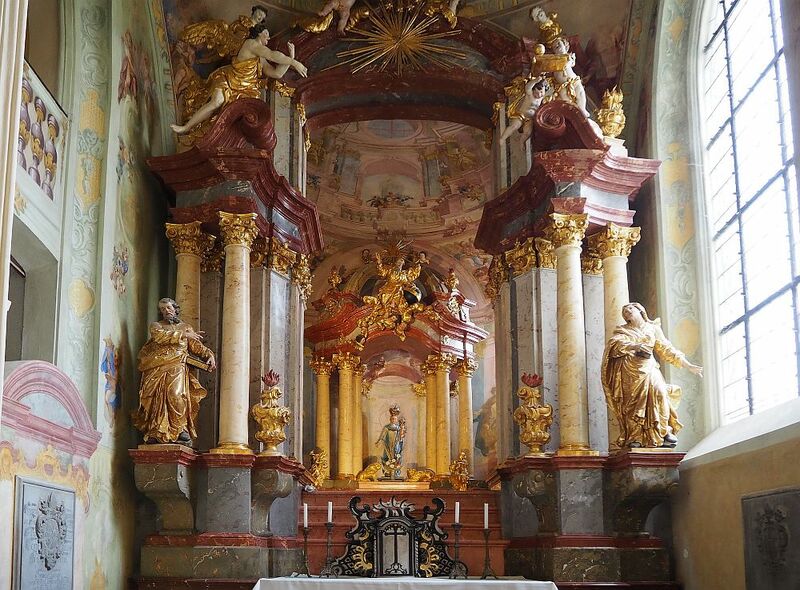 Some really over-the-top Baroque pieces loom in several spots inside the church. A massive Baroque altar in the side aisle of St. Barbara’s Cathedral, part of the Kutna Hora UNESCO site. At the same time, a number of earlier late-Gothic frescoes have been preserved. Some are religious figures, but most of them illustrate the life of this mining town. 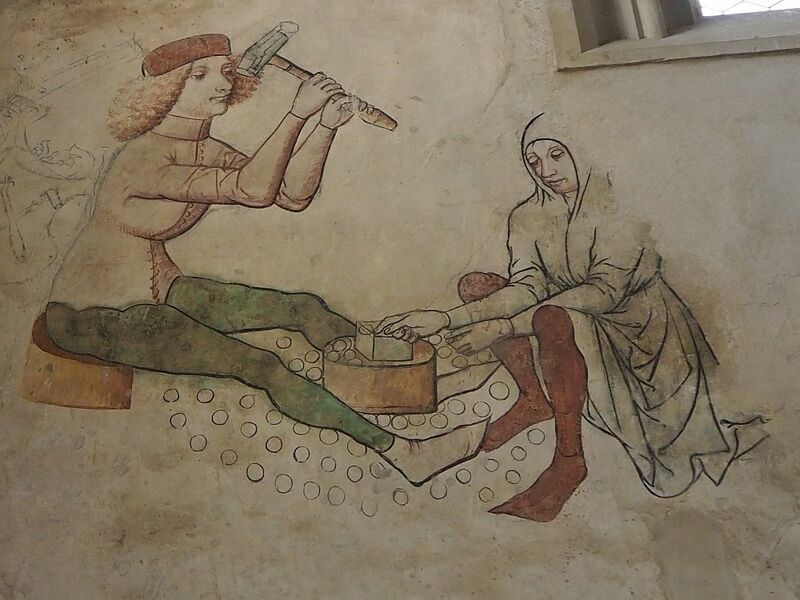 The frescoes inside St. Barbara date to the late Gothic period and portray townspeople in the silver industry. 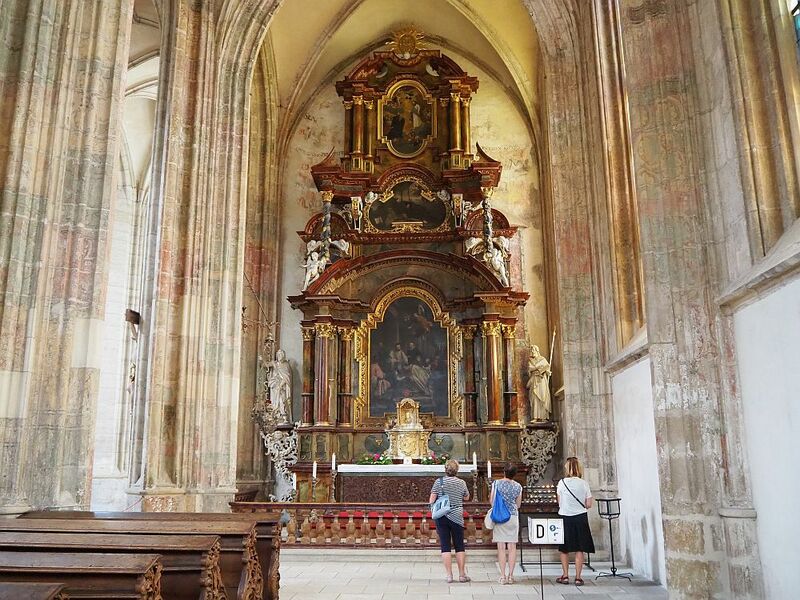 Originally built as part of a Cistercian monastery in the 12th century, this cathedral burnt down during the Hussite Wars in the 15th century. 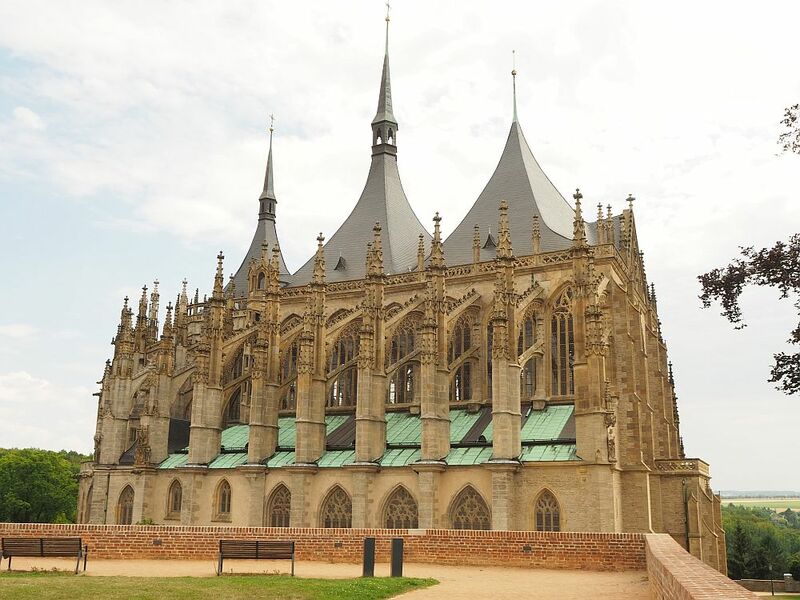 The exterior of the Church of Our Lady, part of the Kutna Hora UNESCO site, appears distinctly late-gothic. The inside, however, is much more baroque. It was rebuilt in the early 18th century. 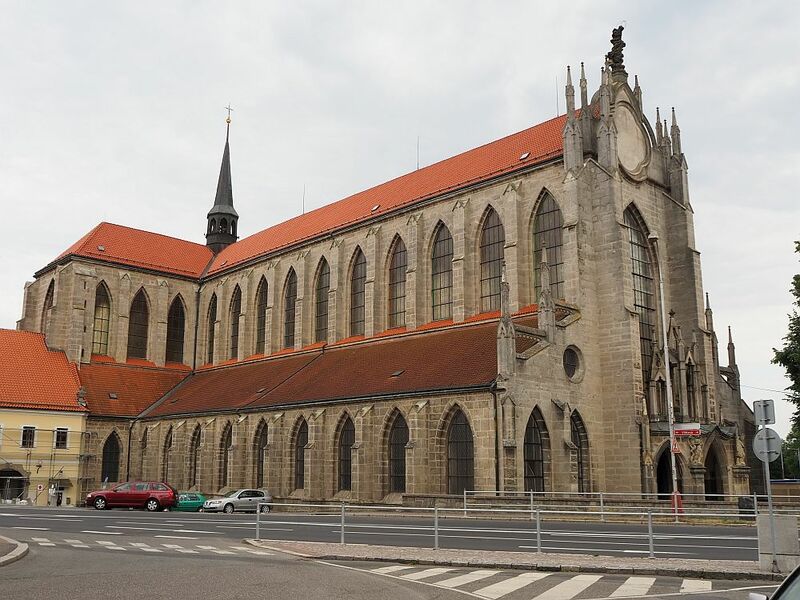 The restoration was designed in a “Gothic Baroque” style by Jan Blazej Santini, the same person who designed the Pilgrimage Church of St. John of Nepomuk. Its inclusion in the UNESCO designation is also about influence: its influence on Baroque architecture in central Europe. The Cathedral of Our Lady is not itself within the UNESCO boundaries. Instead, it is marked as being inside a “buffer zone” around the old city. 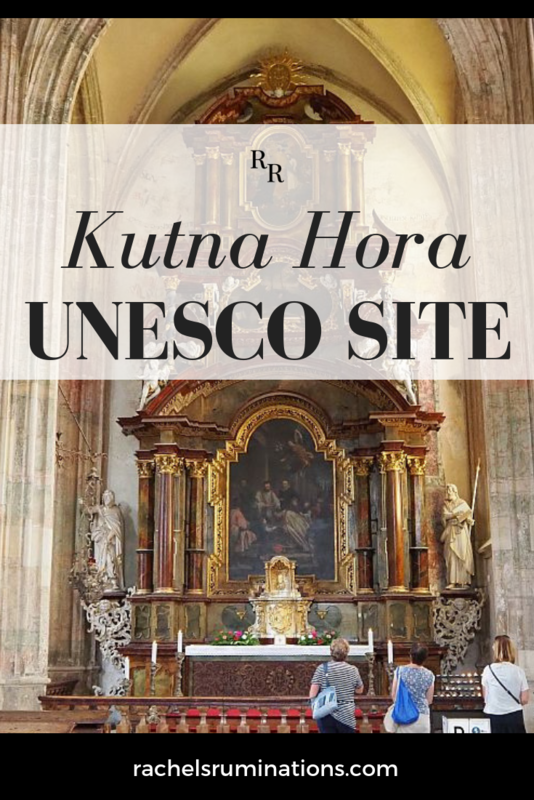 If you decide to visit Kutna Hora old town and these two UNESCO churches, there’s one more stop you should make. 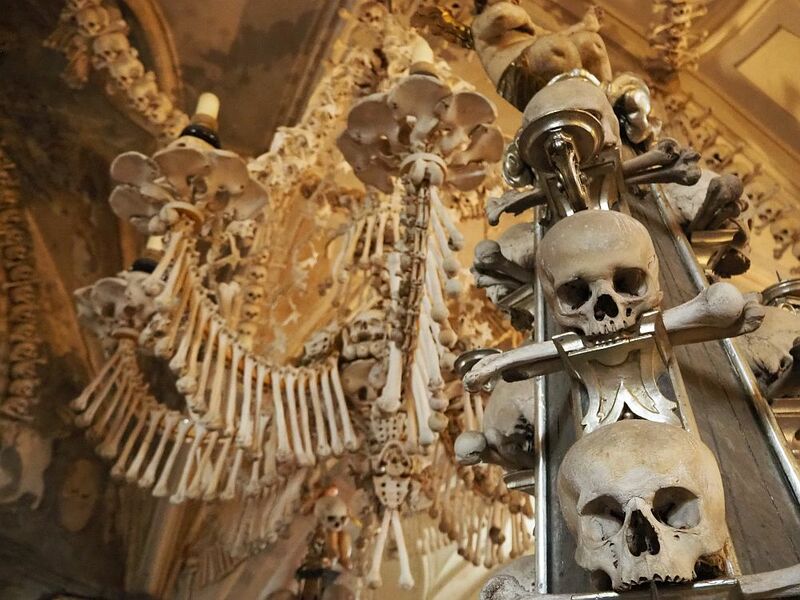 Not far from the Church of Our Lady is another church that’s far more famous than either of the UNESCO churches: Sedlec Ossuary, more commonly known as the Bone Church. 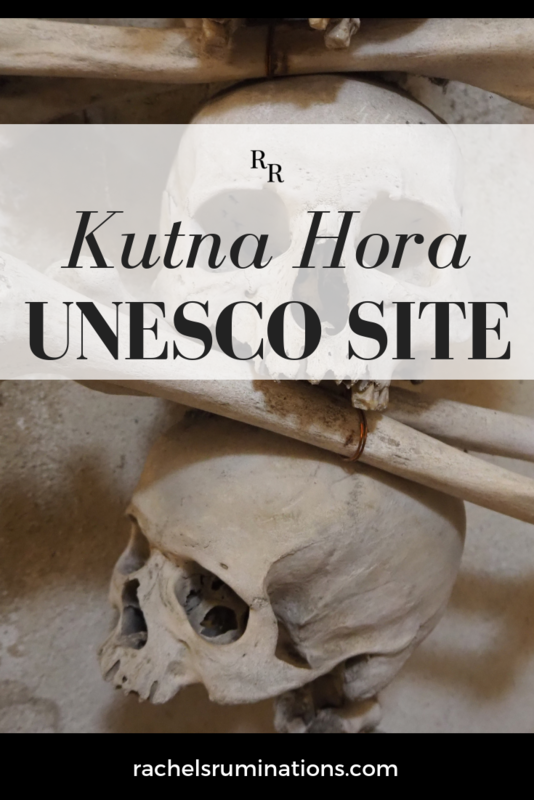 The Bone Church is not actually part of the Kutna Hora UNESCO site. Like the Cathedral of Our Lady, it was damaged in the Hussite Wars, and was restored and redesigned by the same Santini. Many of the local victims of those wars used to be buried here, along with plague victims from a century earlier. Later the cemetery was closed and the bones removed. A view of the Bone Church through the trees. The Bone Church brings in the tourists because in 1511, a half-blind monk took these bones and started building massive pyramids with them. Or it might have been Santini who made the bone pyramids: different sources tell different stories. 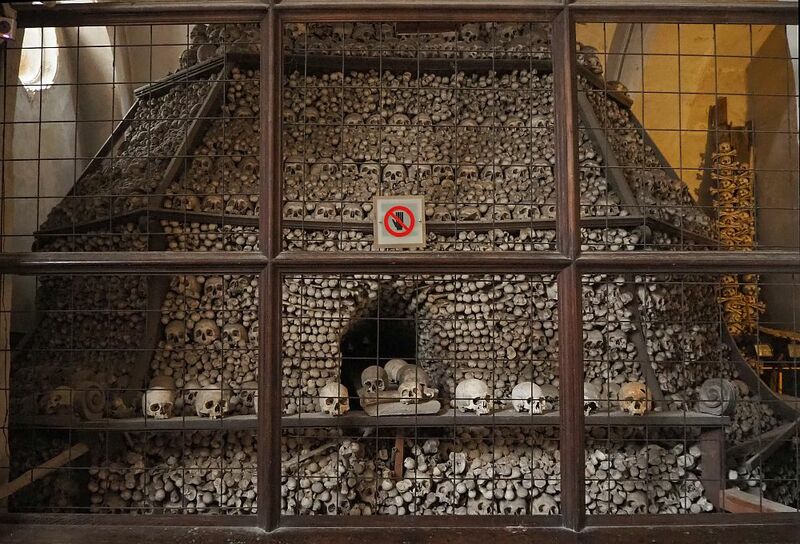 One of the bone pyramids in the Bone Church in Kutná Hora. In the 19th century, a local woodcarver with an artistic bent started making the many “artworks” now on display in the church. Bones are everywhere. Linked together somehow, they festoon the arches, the chandeliers, and pretty much everything else, in some macabre imitation of party streamers. It’s unclear how many people all of these bones add up to: somewhere between 30,000 and 60,000. 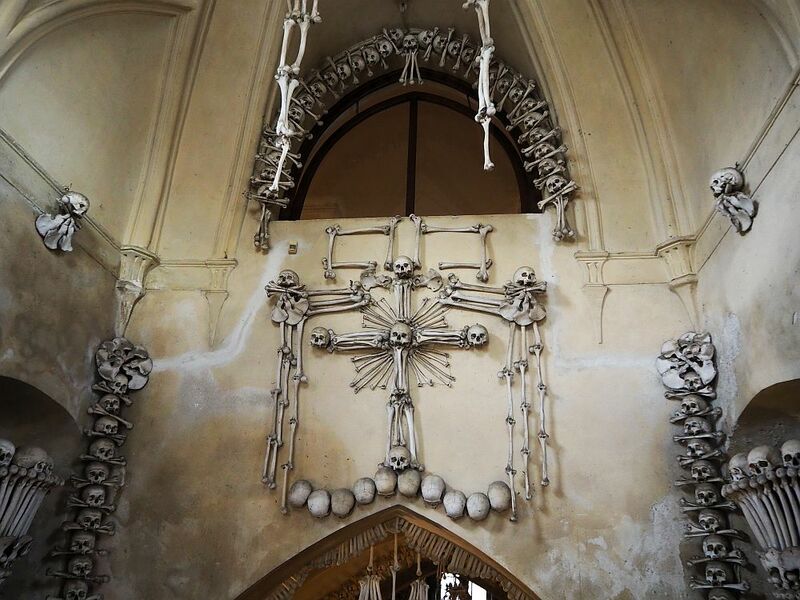 In this photo from inside the Bone Church in Kutná Hora, you can see a stand displaying skulls and other bones and, behind it, a massive chandelier made of bones. As you can imagine, it’s a pretty creepy place. I presume that the intention was memento mori: to get churchgoers to consider the fact that they will die. I suspect, though, that most visitors are more focused on the sheer craziness of creating decorations from human bones. Stepping inside the Bone Church, visitors are greeted by this sight. Kutna Hora is about an hour away from Prague by train. 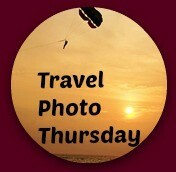 The easiest way to visit, though, would be with a tour, including transportation and a guide. St. Barbara’s Church: Open daily November-March 10:00-16:00, April-October 9:00-18:00. Admission: 60 CZK (about €2.30 or $2.70). Cathedral of the Assumption of Our Lady at Sedlac: Open daily November-March 9:00-16:00 (Sunday 11:00-16:00); April-October 9:00-17:00 (Sunday 11:00-17:00). Admission: 50 CZK (€2 or $2.25). The Bone Church: Open daily in November-February 9:00-16:00, October and March 9:00-17:00, April-September 8:00-18:00. Sundays all year: 9:00-18:00. Admission: 90 CZK (about €3.50 or $4). Where to stay: I’d suggest at least one night’s stay, so you can wander the old town as well as visit the churches. Search booking.com to find a hotel to suit your needs. If you enjoyed this article, please share it! The images below are perfect for Pinterest!